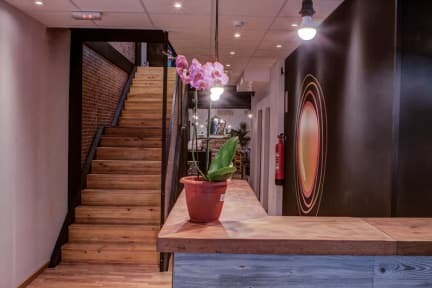 Hostel Olé is a cosy backpackers hostel located right in the centre of Alicante, next to the ''Mercado Central'', which is in the main street of the city. It’s our family buisiness and we are passionate about working with people from all over the world. Therefore we decided to build our own hostel with our 2 hands. We are close to everything you may need: 10 min walk to the beach, 5 min from the train station and 5 min to the old town ( where you can find the best pubs, bars and restaurants)....OH! And don't forget to visit the Arabian ''Santa Barbara's'' Castle which is NEXT TO THE HOSTEL!!! Our facilities include 1 double private bedroom, and 5 shared bedrooms ( every one of our bunk beds are equipped with reading lights and private sockets), 4 shared bathrooms, 1 big and 1 small common room, Bar and kitchen. Free linen, free maps, free coffee and tea, lockers in every room, free WIFI, and breakfast service every morning ( 3€). Our staff is always available to answer any question and recommend places where to go and things to do at any time to get the most of your stay in the city. We love music! That's why we have all sorts of instruments in the hostel and adore it when you want to PLAY MUSIC WITH US. Join us in the PubCrawl, in Netflix night, our BAR offers and much more!! As well for ''peaceful'' people we have a relaxing area where you can find our well-loved and full bookcase. Feel free to exchange your old books with one of ours!! We can’t wait to see you at Hostel Olé!! This property may pre-authorize your credit card before arrival. Absolutely wonderful place! I have only positive thing to say. I stayed 2 nights at this hostel and volunteers gave me assistance various times. I usd kitchen to cook a meal and to share.Improvment to beds are needed . A very good locolation .I would return. HostelOlé was the perfect hostel experience! I was only in Alicante for one night so I just needed a cheap place to sleep. I wasn't expecting much, but the staff, facilities, and atmosphere was worth way more than I paid. The rooms were very clean, lockers easily accessible, bathrooms were spacious, WiFi was consistent and fast. It is a short walk from the beach and the Castle of Santa Barbara (a must-see), and the staff is incredibly helpful with anything you need. Couldn't recommend more! Great location. Good facilities. Pretty good atmosphere. The atmosphere and vibe of Hostel Olé was fantastic, it was so easy and comfortable to be there. The staff was super healful and easygoing and extremely informative on everything from helping us navigate the map, extra necessities or calling a cab. I would stay here again if (if & when) I come back to Alicante. Location is unbeatable, right in the heart of Alicante and super close to the beach! I only stayed here on my last night in Spain after having spent a few other nights in another more modern Alicante hostel. The facilities in HostelOle are a little rougher but it's fine, has everything you need and is in a decent location. I think this hostel has a lot more to offer on the social side than some others. The common area with its own bar is very visible when you enter and seemed to be quite busy when I was there. Just a shame I wasn't staying longer to enjoy that aspect. Would be nice if the hostel staff were more friendly and helpful. Also, the environment feels a little bit unsafe.